“You may encounter many defeats, but you must not be defeated. In fact, it may be necessary to encounter the defeats, so you can know who you are, what you can rise from, how you can still come out of it.” – Maya Angelou. Reflecting upon the work of social development we see many faces, reflecting defeat on the streets that many call home. 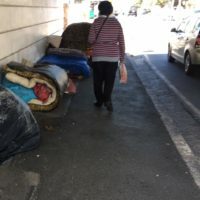 Working closely with the fieldworkers and the social worker, two individuals, one of whom lived on the streets of Muizenberg for almost nineteen years, were reunited with their family. Rising from their defeat. This process of intervention and support focusses on relationship development through counselling and personal development. Living on the streets, you gain a new family and saying goodbye to this family can at times be the biggest challenge during the reunification process. A daunting step for both individuals and their families as they start anew, with one having already secured employment, assisting with independent living. The MID social work services includes counselling support, family reunification, grant applications, child protection, family strengthening, elderly care as well as medical and shelter referrals. This service is free and available at the MID office in the Muizenberg Clinic building every Thursday from 9am to 1pm.